There comes a time in the life of most cities when inner city precincts need a radical re-imagining if they are not to lose their relevance. It is not unusual for the redevelopment of an inner city area to be led by a retail project. After all, the shopping centres of today fulfill much the same functio nas the market squares of history. Cabot Circus in Bristol, England, is one such example – being one of the largest retail-led city centre urban regeneration projects in the UK. Opened in 2008, Cabot Circus is one of our shopping districts in the heart of Bristol, in what is known as the Bristol Shopping Quarter. Together with its neighbours – Broadmead, The Galleries and The Arcade - Cabot Circus forms part of a retail precinct, which offers over 500 shops, together with restaurants, cafés and various attractions. More than just being a project which reignited local interest and patronage in the city centre, the redevelopment has been so successful that Bristol is now one of the top 20 retail destinations in the UK. The overall Cabot Circus development includes shops, offices, a cinema, a hotel and 250 apartments. Its total area is approximately 140,000m2, of which just under 93,000m2 is made up of retail outlets and leisure facilities. The original site of the development contained post-war shopping units and part of the A4044 Bristol inner ring road. Several old buildings and streets we re-demolished to make way for the new project,although it is reported that many of the old streets no longer had houses on them.The Bristol Alliance, which led the redevelopment, first chose the name Merchants Quarter for the new precinct, in recognition of the role that merchants had played in the history of the city, as well as to reflect its role as the new commercial and mercantile centre of the city. However,the name was criticised because the city’s merchants had also been linked to the slave trade in times gone by. Instead, the development was named after John Cabot(Giovanni Caboto), an Italian 15th century explorer, who sailed from Bristol in 1497 to‘discover’ Newfoundland. The scheme was ten years in the planning,followed by four years of site preparation before the main building work began.Inevitably, there were heritage structures tobe taken into consideration as well.One of these was Black friars, a 13th century Dominican priory.Wikipedia has it that “After the dissolution of the monasteries the site had various secular uses, and in 1749 became the location of a Quaker meetinghouse, now known as Quakers Friars.In 1739 John Wesley built his Methodist chapel, known as the New Room, in the street.” Shops were built in the vicinity and in the 18th century, a covered arcade was built between Horsefair and Broadmead, which still survives. Cabot Circus comprises three multi-level pedestrianised streets, including apartment block areas. Its focal point is The Circus,which has a large glass-panelled roof.Anchored by House of Fraser, Harvey Nichols and Showcase de Lux cinema, the retail,leisure and residential space integrate seamlessly within the Quakers Friars area of the city centre. The retail element of Cabot Circus has over 120 shops, including the two department stores, several restaurants, a thirteen-screen Showcase Cinema de Lux, and a Jungle Rumble Adventure Golf centre. It is divided into two main areas – the Circus itself and Quakers Friars. The Circus is divided into three streets and multiple levels. Retailers include New Look, Urban Outfitters, Zara, Hollister Co, H&M, The Body Shop, JD Sports,Pull & Bear, Smiggle, Boux Avenue andHouse of Fraser. Above at the highest level are the cinema and eateries which includes Giraffe, Bella Italia,Frankie & Benny’s, Nando’s, YO!Sushi, Zizzi and Gourmet Burger Kitchen. There are also cafés and restaurants on the upper ground floor, including Five Guys, TGI Friday’s and Pret a Manger. On the opposite side of Penn street is the Quakers Friars area, which houses Harvey Nichols. Other outlets in the area include French Connection, Hugo Boss, Michael Kors, Kurt Geiger, Fat Face and an Apple Store. Philadelphia Street studios, which closed in 2014, has also been used for exhibitions and gallery hire by various Bristol-based art galleries including Antlers Gallery. In January 2016, the American women’s wear and lingerie retailer,Victoria’s Secret, opened their first store in the South West at Cabot Circus.The centre is readily accessible, being at the junction of the A4044 and A4032, close to the end of the M32 motorway. It has 2,500 parking bays for cars, including parent and toddler bays, plus electric car bays with chargers. Drivers can also access the centre by using one of Bristol’s three Park and Ride services; Long Ashton, Portway and Bath Road. Bus stops for services from all parts of the cityand region are within walking distance. Thenearest railway station is Bristol Temple Meads, from where Cabot Circus can be reached by bus, taxi or on foot. 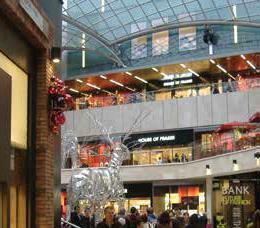 According to the Bristol Shopping Quarter’s website, the Cabot Circus is an extremely popular centre. “Cabot Circus is a fantastic shopping centre, providing city centre visitors with over 120 shops including 15 major flagship stores and signature stores Harvey Nichols and House of Fraser. Covered by a unique shell-shaped glass roof the size of one and a half football pitches, Cabot Circus is linked by a specially designed raised footbridge to a new state-of-the-art car park,allowing visitors to cross Bond Street without having to navigate the traffic below,” it states.With a residential catchment population of 2.4 million, a market potential of over £1 billion and a footfall figure of 17.5 million per annum, it has no shortage of customers.The master plan for the greater Cabot Circus precinct as well as for the shopping centre itself was done by Chapman Taylor Architects, a renowned international firm of architects and urban designers. From a planning perspective, they needed to respect the ancient history of the site, which has been done through the retention of Quakers Friars as the main public space in the centre. Feeding into this, they created a network of safe, welcoming streets designed to attract people back into the city centre from out-of-town retail parks, but with reduced traffic impact. “As master planners for the whole development and designers for the retail and leisure elements of Cabot Circus, Chapman Taylor introduced new buildings, open streets and appropriately proportioned squares that sit naturally within the city’s established urban scale,” their website states. From an architectural point of view, the scheme was the first in the UK to realise alight-weight,grid-shell roof structure which provides cover for this naturally ventilated, multi-level development. Chapman Taylor worked closely with leading artist, Nayan Kulkarni, and consulting engineers, Schlaich Bergermann und Partner, to produce this free form,shell-shaped glass roof – one of the scheme’s most dramatic elements.The Cabot Circus development has been recognised in many ways. It was the first retail-led development in the UK to achieve the highest BREEAM* rating of Excellent. In 2008, it won the MAPIC retail award for best shopping centre of the year, and the European Parking Association’s Standard Parking Award. It was also awarded a Supreme Gold for the “Best In Town Retail Scheme of more than 300,000 square feet”by the British Council of Shopping Centres. In 2009 it racked up no fewer than five awards,including the Bristol City Council LABC (Local Authority Building Control) Built In Quality and Sustainability Award; an Insider Property Award for Regeneration Scheme of the Year (South West);a structural steel design award from Tata Steel; a structural award and was overall winner in the South West Planning Achievements Awards for 2009. Cabot Circus was developed for the Bristol Alliance, and is currently owned by Hammerson and Axa Investment Managers– Real Assets on a 50-50 basis. Hammerson is a British REIT and is an owner, manager and developer of retail destinations in Europe.Its portfolio includes investments in 23 prime shopping centres in the UK, Ireland and France, 17 convenient retail parks in the UK and 20 premium outlets across Europe. AXA Investment Managers is an active, long-term,global, multi-asset investor focused on enabling more people to harness the power of investing to meeting their financial goals. It has become one of the largest asset managers in Europe with ambitions to become the chosen investment partner of investors around the world. With approximately€735 billion in assets under management as of end June 2017, AXA IM employs over 2,450 people based in 29 offices around the world. AXA Investment Managers - Real Assets has over €71 billion in assets under management, including €54.5 billion in direct property and infrastructure and €13.6 billion in real asset finance as of end of June 2017. *BREEAM is the world’s leading sustainability assessment method for master planning projects, infrastructure and buildings. It addresses a number of life cycle stages, such as New Construction, Refurbishment and In-Use. Globally there are more than 530,000 BREEAM certified developments, and almost 2,200,000 buildings registered for assessment since it was first launched in 1990.